McClain’s Dalton Mischal drives against Jackson’s Caden Donaldson Friday at Jackson High School where the Tigers battled the Ironmen in FAC boys varsity basketball action. Dalton Mischal on McClain attempts a layup with four defenders focused on him on Friday at Jackson High School. Mischal led the Tigers with 18 points in the game. 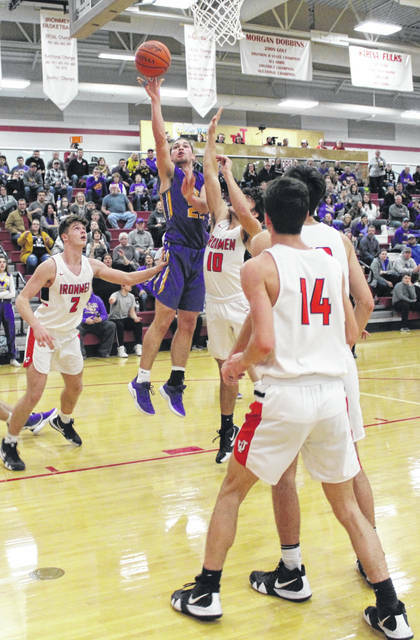 The McClain Tigers traveled to Jackson on Friday and took on the Jackson Ironmen at Jackson High School in a matchup of two of the top teams in the Frontier Athletic Conference. The Ironmen, who fell to the Tigers 50-48 in their first game on December 7, 2018 at McClain High School, returned the favor with a 56-48 win. The Tigers started the game with a five unanswered points and lead 10-6 with just over four minutes to play in the first quarter but, the Ironmen were not ready to fold to the Tigers and used the next two minutes and 35 seconds to scored nine consecutive points and take a 15-10 lead. Cooper Donaldson led the Ironmen with nine points in the quarter and Jackson held a 17-14 lead heading into the second quarter of play. Jackson was able to push its lead to 21-14 with 5:45 to play in the half before McClain rallied with eight unanswered points and took the lead at 22-21. Kobe Penwell capped off the Tigers’ run and with 2:12 to play in the second quarter when he converted two free throws. However, Brice Graham scored with 1:07 to play and the Ironmen took a 23-22 lead into halftime. Dalton Mischal, who finished with 18 points for the Tigers, gave McClain the lead at 24-23 with a steal and layup but, it was short lived as the Ironmen hit a three pointer a short time later to take back control. The Ironmen extended their lead to 35-28 with 3:52 to go in the third and led 40-34 at the end of the quarter with McClain outscoring Jackson 6-5 over the final minutes. The Tigers opened the fourth quarter with a 12-5 run that gave them the lead at 46-45 on a wide open layup by Bryson Badgely. However, the Ironmen responded with a three pointer by Caleb Wallis to put them ahead for good at 48-46. Jackson finished the game on a 6-2 run to provide the final 56-48 margin of victory. 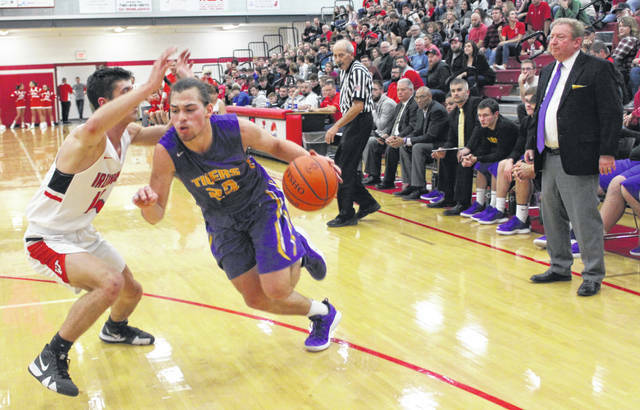 The Tigers will be back in action on Tuesday, January 15, when they host the Tigers of Circleville in a non-conference matchup. Information for this story was provided by Paul Boggs.